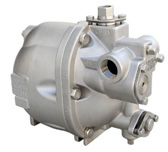 TLV is pleased to announce the release of the Stainless Steel (A351 Gr.CF8M) GT5C PowerTrap® Mechanical Pump/Trap. Since the launch of the cast iron GT5C in October 2007, TLV has received numerous requests from various industries – particularly Food, Pharmaceutical and Chemical – for an alternative to the cast iron version. Stainless Steel is resistant to rust from washing. (Frequent cleaning with water is performed in Food and Pharmaceutical plants, which may cause cast iron to rust if located on the floor). Some industries (like Chemical) will not use cast iron products in their plants. The Stainless Steel GT5C has the same capacity, pressure and temperature specifications as the cast iron version. The only differences are a slightly lower weight, and a slightly changed location for the Exhaust Outlet Port.